Taking good pictures of the night sky is not only about camera technique. It is about knowing what to shoot and how to edit the pictures you take. Here is a brief overview of good software programs to identify the shot and edit it in post. Star Walk: Helps easily identify stars, planets, constellations, comets, satellites, star clusters, nebulae and meteor showers ($2.99). StarWeek Plus: Provides a day-by-day calendar of events to observe in the night sky ($2.99). Dark Sky Finder: Highlights the best light pollution-free places for stargazing and astrophotography ($1.99). PhotoPills: Tells you when the sun, moon, and Milky Way will be visible in a particular location, allowing astrophotographers to plan shots ahead of time ($9.99). If you are new to astrophotography, don’t be disappointed if the images you take on your camera don’t look like much at first. As with many types of photography, post-production makes all of the difference. There are a number of software programs that can assist with image calibration, correction and enhancement. Some are even free. As mentioned in a prior post, multiple images can be aligned and stacked to create a better quality master image. In essence, the process increases the signal to noise ratio and allows you the flexibility to further edit the colors and details. While it is possible to use Photoshop and mathematics to stack images on your own, the process is tedious. It is also unnecessary given that there are a number of software programs that will do it for you. For newbie astrophotographers, Deepsky Stacker is a very capable and easy to use program. The software allows you to align and stack images as well as perform a number of other post-processing functions. Best of all, it’s free. Other free programs include Regim, RegiStax, and Iris. Of course, there are a number of paid software programs that offer more advanced capabilities. 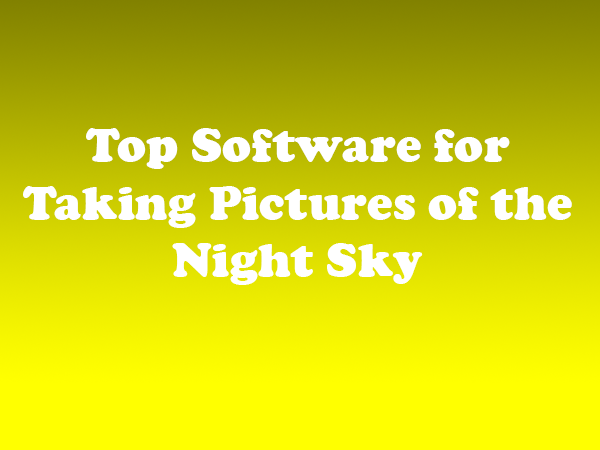 PixInsight and Astronomical Image Processing (AIP) are among the most popular. Images Plus is the most expensive at $180, but well worth the investment for serious astrophotographers. Once you have created a master image, you can return to standard editing tools like Photoshop. Common adjustments that you will want to consider include adjusting the black point, increasing the contrast, increasing the brightness, and increasing the color saturation. There are tutorials available online, such as Photoshop for Astrophotographers. Is the Sigma 50mm F1.4 DG HSM the Best Art Lens on the Market?